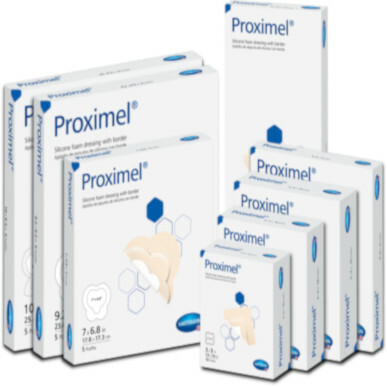 Size: Select Size 3"x3" 4"x4" 6"x6"
Proximel® is the ideal solution for both the prevention and treatment of wounds. • Gentle on patients' skin to reduce irritation and pain, enabling the dressing to be changed without stripping epidermal cells. • Can be lifted or repositioned without leakage or loosening. • Small perforations in the absorptive pad reduce risks of in-growth. • Evenly distributes fluid across dressing. • Waterproof barrier seals out bacteria. • Five-layer design that promotes healing and supports pressure injury prevention.